Here's how to enjoy creating an eco lawn without tears. What do I mean by an eco lawn? Simply one that is created and maintained using organic methods and without much by way of energy inputs such as petrol or electricity. Lawns are quite demanding features of a garden. They can lap up time and energy, too. Here are some ideas for keeping the demands down, while still creating a beautiful place for you and your family to enjoy. Cut the problem down to size! The first and perhaps easiest thing to do is to simply reduce your lawn size. Shrubs and borders have their needs but they are generally less obtrusive. Uncut grass is hard to ignore for most gardeners (I'm practising!) 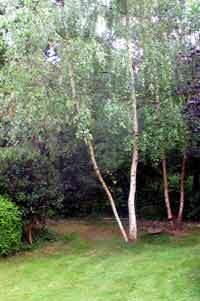 Shrubs can remain untrimmed for quite a while before they begin to look neglected. A well-planned shrubbery can also suppress a good deal of unwanted weed growth. Mulching and ground cover plants can help too. All this takes a lot less time than mowing, raking, aerating and rolling. Even if you leave out most of those processes, a well-tended lawn will need mowing at least once a week to look its best. Wildflower meadows need cutting a lot less often than a regular lawn. Your own wildflower area can be a valuable part of your eco lawn - a place to relax and gaze at the sky or watch the butterflies. If you convert a good proportion of your lawn to wildflower meadow you will save time and effort in the long run. Starting a wildflower meadow area can take a bit of time and trouble but once established they are quite easy to maintain. You can find wildflower seed mixes in many horticultural outlets, including Amazon. Choose an area of the garden that gets less use and prepare it well for sowing. Alternatively, you can choose a lawn area and cut it less frequently. If cut with precise borders, these long grass areas will look reasonably attractive and some flower species may gradually establish themselves. Many insects and small birds can benefit from wild grass seeds and flowers which are otherwise becoming scarce in suburban areas. Here are a few ways to look after your lawn - always with an eye to saving time and trouble and keeping it green - in both senses of the word! Lawns benefit from aeration, especially if drainage is a problem. You can aerate your lawn by wearing spiked clogs and walking about. You can also achieve the same effect with a fork. Put the fork tines into the earth at regular intervals. The best depth is about 6 inches (15cms). Work carefully across the area in an orderly way. For best results brush in sharp sand immediately. This stops the holes from filling back up with soil. You will stimulate growth by periodically removing "thatch". For this you need a spring tine rake which does the job without significantly damaging the grass root. You are aiming to remove the thatch of dead grass and moss which can significantly reduce drainage and light. This is best done twice a year, autumn and springtime. Moss makes a good water-retaining mulch for other areas of the garden; use it beneath trees and shrubs and larger border plants. You can also compost the thatch, if you wish. Add fertility to your eco lawn in autumn by top-dressing it with soil, sand and compost in a 3/2/1 ratio. This fills in bumps and hollows and gives everywhere else a boost. You can adjust the proportions, depending upon your local soil conditions. For example, I never add any sand to my lawn as the soil just beneath the surface is almost pure sand in some places. Sieve the soil and compost first to remove stones and woody bits. Mix everything well and spread the top-dressing around the lawn with the back of a rake. Don't over do it; the aim is not to submerge the grass. The new shoots should be able to grow up easily from beneath. Lawn worm casts are full of valuable nutrients, so spread them over the soil before mowing to share the wealth! This stops weed seeds from benefiting from them too much. Get rid of weeds by pulling them individually. You can buy a specialist tool for the job which helps with deep rooted weeds such as dandelions. A small pinch of salt in the centre of each offending plant will also do the job, rather more slowly. Don't overdo using salt on the garden - it can be quite harmful to many plants. I like to keep plenty of "weeds" such as dandelions and daisies; they do no real harm and look beautiful when in flower. For a lush eco lawn you need to adapt your cutting techniques to your local conditions. It also depends upon what you require of your lawn. The more often you mow it, the finer will be the qualities of the grasses present. Coarser grasses take over if you don't mow often enough. In dry places, or dry times of the year you need to mow far less often so that the grass to some extent becomes its own shade. Longer grass suffers less quickly during drought conditions. Set your blades higher when the weather is adverse - too hot, or too dry. Lawns which are in shade will grow more slowly and need less frequent cutting. The ground may be far damper, so a higher cut is more desirable as it will cause less damage. In dry weather leave the grass box off when you cut. The left mowings will to some extent protect your lawn from the sun and help retain moisture. About once a week is a good frequency for most lawns in the summer growing season. Less often is "greener" if you have a petrol mower as you are saving fuel. Leave the grass box off for a free fertiliser if you don't mind the inconvenience of clumps of dead grass mowings on your lawn. For the greenest grass cutting, you should use a push lawn mower (reel mower) or even a scythe! For more on the benefits of a push lawn mower please see this page. Picture, right: Lawns in shade may need cutting less often as growth can be slow. In summer heat shaded areas may grow well when everything else is struggling.